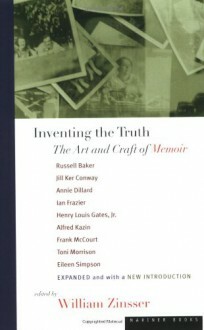 An indispensable book by writers who have experienced firsthand the rewards and challenges of crafting a memoir Anyone undertaking the project of writing a memoir knows that the events, memories, and emotions of the past often resist the orderly structure of a book. Inventing the Truth offers wisdom from nine notable memoirists about their process (Ian Frazier searched through generations of family papers to understand his parents' lives), the hurdles they faced (Annie Dillard tackles the central dilemma of memoir: what to put in and what to leave out), and the unexpected joys of bringing their pasts to the page. Featured authors include Russell Baker on Growing Up; Jill Ker Conway on The Road from Coorain; Annie Dillard on An American Childhood; Ian Frazier on Family; Henry Louis Gates Jr. on Colored People; Alfred Kazin on A Walker in the City; Frank McCourt on Angela's Ashes; Toni Morrison on Beloved; and Eileen Simpson on Poets in Their Youth.